It's time for another Watercooler Challenge and it's all about color. I managed to use all five of the colors in my design. To get some of the Pool Party into the design, I took some Whisper White Baker's Twine and dyed it with Pool Party Ink. I've colored ribbon before but not the twine. It worked well, so now I'll probably go on a twine dying frenzy. Why didn't I think of it before. I can have whatever color twine I choose. Yay! We so hope you will join us this time and show us what you can do with these great colors. Just link up on the Watercooler Challenge Blog to be considered for the winner for this challenge. Only one participant will have that honor and the only way to win is to play along. The colors are from the current Watercooler Challenges. thanks for sharing your creations Marsha! Hi Terri! Good to see you here. Thanks for leaving a comment. Lovely card Miss Marsha. Wonderful the way that you mixed in the colors with so many textures and images. Very creative. I really love that Kinda Eclectic. You really make it sing! Thanks for sharing your talents with this challenge. Hugs, Blessings and Happy Easter my friend. Thanks, Jean. I love Kinda Eclectic and I have used it often. It has become a go to stamp set for me. 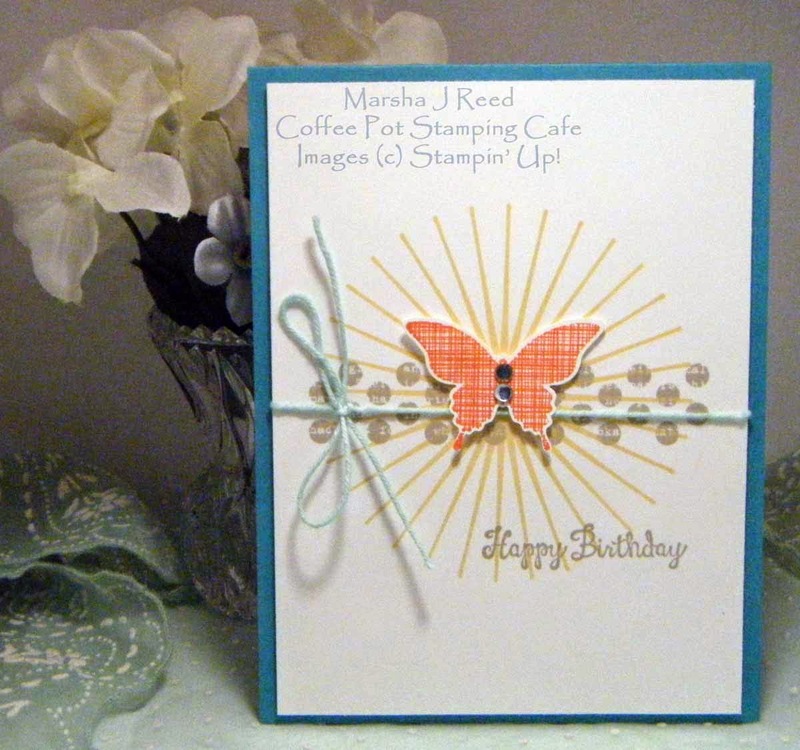 Kinda Eclectic is such a cool stamp set and I really like how you used it with this card. Great tip on dying the butcher's cord, I never thought of doing that either, but now I'm sure I will. Thanks for sharing Marsha, great birthday card! Thanks, Penny! I love Kinda Eclectic and I have used it the most of all the new stamps I've purchased.